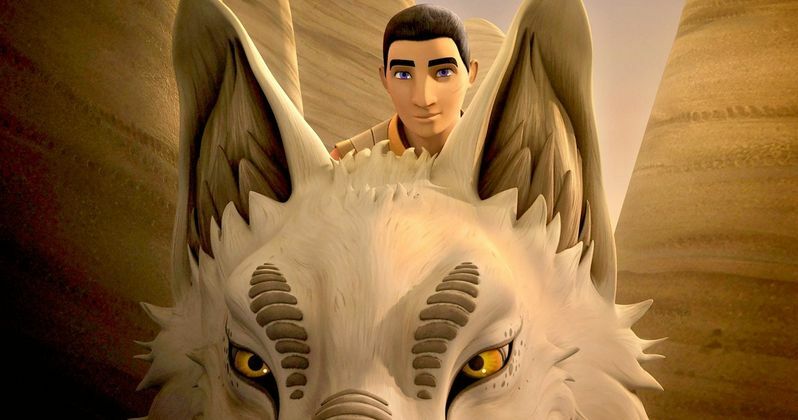 Star Wars Rebels finally sheds light on the mystical Loth-wolves. The gigantic, furry beasts with the ability to teleport are linked to the Jedi temple on Lothal. Wolves and a Door has Phoenix Squadron on a daring mission to uncover the secrets of the temple. We also get an appearance...drum roll please...from Emperor Palpatine, voiced by the great Ian McDiarmid. The plot does indeed thicken. Wolves and a Door opens with Ezra (Taylor Gray) bringing his compatriots up to speed. The Empire is doing something terrible at the Jedi temple. He shows them the tablet that the wolves gave him. Sabine (Tiya Sircar) inspects it, but cannot make heads or tails. They must journey to the temple to decipher the tablet. The problem is they have no ship or speeders for the long journey north. Ezra decides to call for help. Ezra reaches out towards the plains. The Loth-wolves appear in the grass and move towards them. The white wolf approaches Ezra, he asks for help getting to the temple. The creature nods and he gets on its back. Hera (Vanessa Marshall), Sabine, and a reluctant Zeb (Steve Blum) each hop on a wolf. Chopper starts to chirp, but is then grabbed by a wolf in its mighty jaws. They take off into the plains. As the grass engulfs them, they disappear into a hyperspace tunnel. Visions and voices from the past surround them. Kanan (Freddie Prinze Jr.) battles the Grand Inquisitor (Jason Isaacs). They also hear a distant Ahsoka Tano (Ahsley Eckstein). Related: Star Wars Rebels Season 4 Soundtrack Reveals Huge Jedi Spoiler? The Ghost crew awakens in the snow of the far north. Hera wonders how the wolves transported them so far. Zeb is happy the wolves are on their side, but Ezra corrects him. The wolves are on Lothal's side. They crawl towards the temple. The Empire has a massive excavation at the site. Artwork, on giant rock blocks, line a huge painting on the temple wall. They see two scouts on speeders guarding the perimeter. Chopper throws up a hologram of Grand Admiral Thrawn to stop them. Zeb dutifully knocks them out. Ezra and Sabine don their armor, while the rest watch from above the site. Rodian slaves are working under guard. Ezra and Sabine walk towards a piece of art to inspect the markings. They are stopped by Minister Hydan (Malcolm McDowell) and a pair of black-clad death troopers. He curses them for touching the piece; a tiny blemish could ruin their understanding of the "gateway". A trooper tells Hydan he has a message incoming from Coruscant. He leaves the death trooper to scold Ezra and Sabine, who is easily distracted by the Jedi mind trick. Sabine radios to Chopper to listen in on Hydan's communication. It is Emperor Palpatine. They have found art from the Mortis Gods in the temple. Hydan has seen them before in the Jedi archive. The message actually refers to "The Clone Wars", when Ahsoka, Anakin, and Obi-Wan discovered the gods. There were three that controlled the Force. The Father, Daughter, and Son. The Father wanted Anakin to stay, as the chosen one, and represent the balance between the Daughter (light) and the Son (dark). Anakin refused and the gods were presumably destroyed. The Emperor continues that Kanan's death has changed the fate of Lothal. They must get inside the temple and seize its power, "the conduit between the living and the dead". Hera is worried about the Emperor. She wants to retreat, but then a Force ghost of Kanan appears at her side. He pats her on the shoulder, reassuringly. Hera sighs and orders the two below to continue. Hydan commands everyone to work double shifts. When he leaves, Ezra and Sabine move to investigate the painting of the gods. Ezra recognizes the owl that sits on the Daughter's shoulder. He remembers that it was always near Ahsoka. Sabine notices the placement of the gods' hands. She opens a hologram of the tablet. She realizes that the hands in the painting must be moved to match the direction of the Daughter. Ezra touches the painting and reaches out with the Force. Stormtroopers approach them, but Sabine moves to distract their attention from Ezra. As he changes the hands, the Loth-wolves at the bottom of the painting come to life and start to walk alongside the wall. Ezra follows them. The wolves lead Ezra to a seemingly blank space of wall. They then run in a circle, creating a gateway. Meanwhile, Sabine has been taken to Hydan's command center. He removes her helmet and is stunned to see the rebel. He orders a lockdown. The stormtroopers see Ezra and race towards him. Ezra touches the wall. His hand disappears into it. He leaps through the gateway as they close in. The troopers hit rock as the portal closes behind Ezra. The throwback to the Mortis Gods was a cool surprise. I love how rebels links to events in the clone wars. The temple on Lothal is the key to the entire series, a gateway through space and time. We'll find out what awaits Ezra in A World Between Worlds, the next episode on Disney XD.